who ima b seein son..
It’s about to get very interactive up in this houssssssssse. 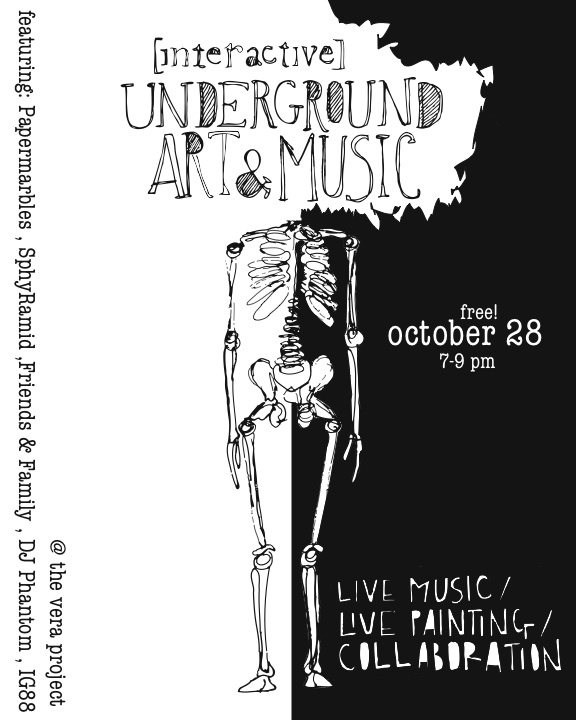 My friend Rani and I have organized an art and music showcase, happening at the Vera Project, tonight from 7-9PM. For 2 hours you can witness the art literally covering the Vera walls, provided by the very intriguing Paper Marbles. Not only can you marvel at his stuff, you can make your own. 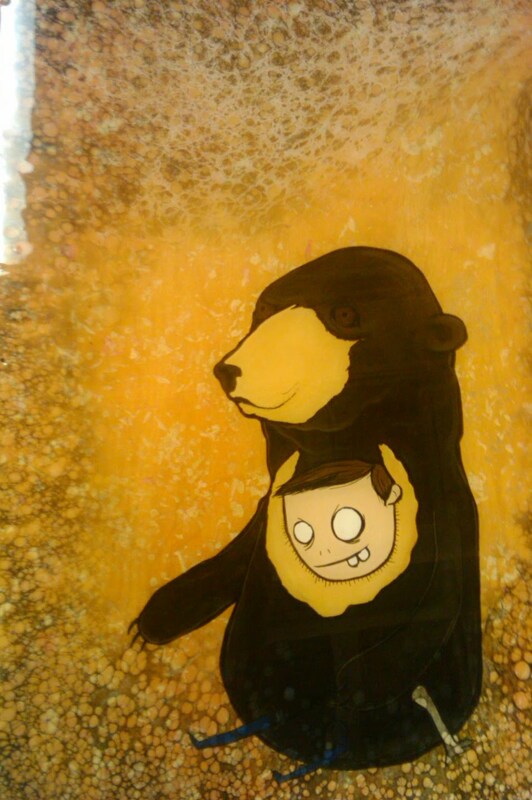 Bring your paint, brushes, crayons (we will have some..) and work on a piece that will be hung at Seattle Center! This show is meant to be interactive, the only pieces hung will be those made on the spot as part of this event yo. If that’s not enough to tickle your fancy, live music will be provided by Friends and Family, IG88, myself (DJ Phantom) and Sphyramid. I got a small interview with Paper Marbles, get to know em’. 1. Do you listen to music while you draw your pieces? 2. 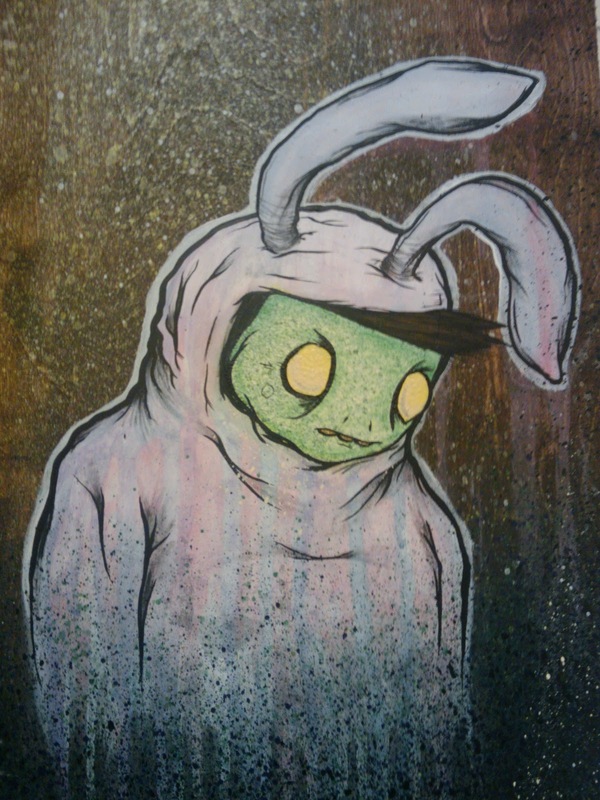 You’ll be showcasing your art at the Vera Project tonight, how did this come about? What will the process be for getting your work up for everyone to see? 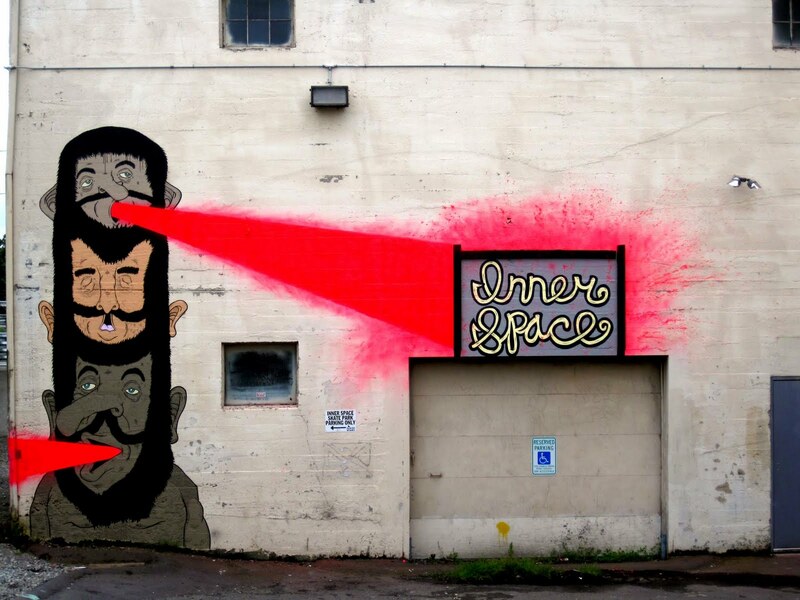 I’m actually finishing a Mural at the Vera Project on Thursday for part of their new mural program. I got an email out of the blue back in the spring – a kind of invite to propose an idea, and jumped on it. Something about my babbling on about my idea worked I guess. The process and the work is the fun part… Since the original proposal, the idea has morphed, and been fine tuned a bit – sketched, re-sketched, measurements taken… details. As far as the actual painting/mural goes, I’ll be painting at the Vera as much as I can in these next few days leading up to the event and also throughout the night of it as well; I’m also working on some other elements of it in my “off-time.” But in true artist fashion, I’m sure I’ll be working up until the bitter end to squeeze this thing out just in time. 3. How would you describe the styles and themes within PaperMarbles? 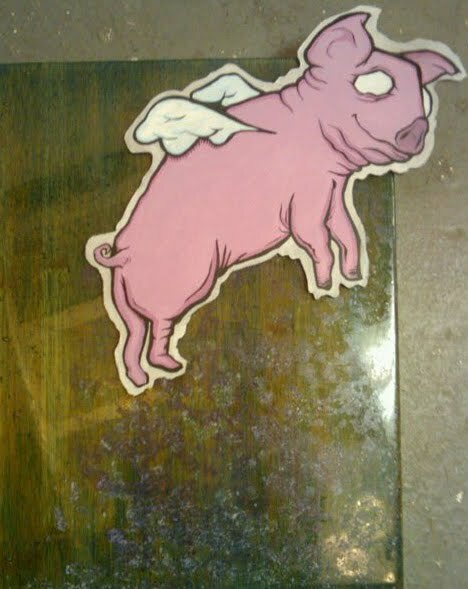 My work is a product of years of being influenced by comics, cartoons (80’s/early 90’s cartoons, not this janky, glittery churched up BS you see on tv now), graffiti, and countless hours of drawing my daydreams. I don’t have a formula for ideas or anything, I normally approach each piece separately, and whatever it is I feel like painting, whether I think its funny, something clever, or something I feel like getting off my chest is what ends up coming out. Each piece normally takes off in its own direction, and ends up where it needs to be in the end – even if it’s not how it was planned… I like to make things bold, full of color, and to be slightly off kilter to what you would call normal or expect. SPINNAFACE ! ! !! ! !!! this guy…this guy! such a pleasure to have him spinnin all over Disco Droppings. I’m all about strong themes in music. Daft Punk has fo sho helped cement that feeling, and seeing artists create their own environment just gets me goin’. And..I can’t deny that HOUSE sound..
Get your digital hands on these free sounds..
and to just overwhelm you, 7 Deadly artist Deepearth.void has put his touch on a Spinnaface track – pick this one up! 1. What do you love about electronic music? Lots of things to love about electronic music. Its always on the cutting edge, innovations, new styles, new technology, new sub-genres all seem to happen first in electronic music. Also the international community. Its one of the only styles of music that is created and embraced all over the world, artists from every country developing new styles and contributing to molding the cumulative sound of electronic music. All of these things bring a raw and constantly evolving energy and feeling to electronic music like no other. 2. I’ve been listening to your WFMU Radio mix, suppper funky! Who have been some of your biggest influences in creating the Spinnaface sound? 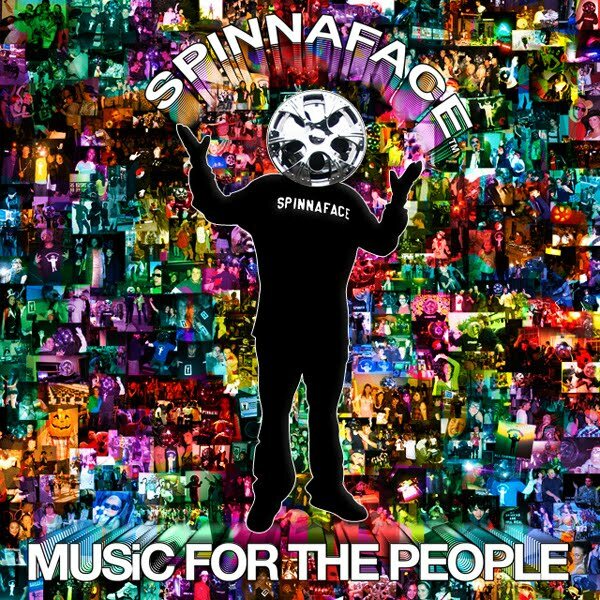 Thank you… Spinnaface’s sound is a reflection of listening to 1000s of different artists across all genres. So many great artists, now more then ever with the computers and the internets bringing powerful creation tools to almost anyone. I get a lot of inspiration from the internets, there are so many dope underground artists making and sharing music. To be able to listen to a beat someone I never heard of made on their laptop yesterday, or a hype live mix that was recorded last night by sick DJ, that really inspirez me. Also new technology. Getting my hands a new synths, midi controllers, application or whatever can be really inspiring. A few of the artists Im currentlys bumpin a lot of: George Clinton & The Parliament, Zapp & Roger, Herbie Hancock, Mtume, One Way, James Brown, Roy Ayers, Egyptian Lover, Arabian Prince, Prince, Rick James, Bootsy, Giorgio Moroder, Mac Dre, Too Short, Andre Nickatina, Pibes Chorros, Daft Punk, Diplo, Chromeo, KTN, DJ Screw, Chrissy Murderbot, J Dilla, Flying Lotus, Dâm-Funk, Joker, Michael Jackson, Andy Milonakis, Monster Squad, Drankenstein, Cut Copy, Das Racist, Treasure Fungers, Fukkk off, The Swiss, edIT , The Glitch Mob, Ylem, Rustie , Mrs Qeada, Randy Barracuda and almost anything on Soundcloud. 3. Is it hard having a Spinna for a face? Driving around, going to work, eating…? a crowd but that’s okay. People dig it so I stay spinnin’..
4. You have an album called “Music For The People”, what’s your relationship like with your fans? How have they helped shape your approach to sharing music? Its all about the fanz… I love ya’ll! 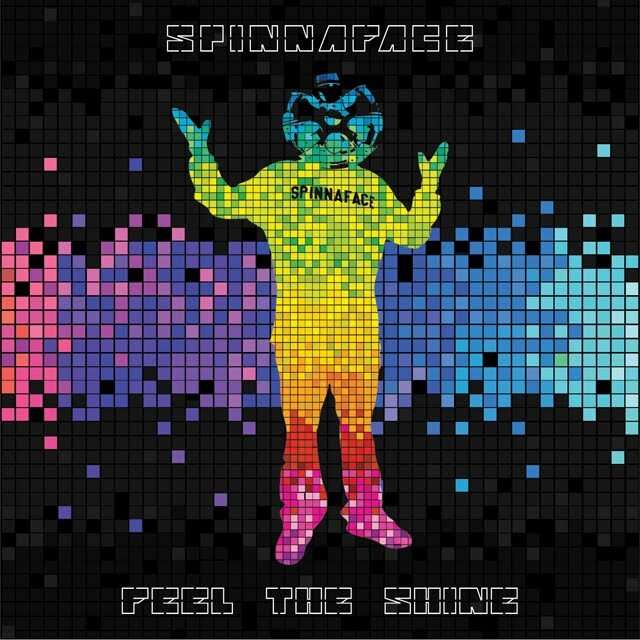 Spinnaface’s music is direct reflection of the people who listen to it. All the support and energy I receive from fanz and fam is what keeps me spinnin! So I feel I gotta share it with the people who helped to create it, and everyone else too. Im a big fan of open-source. I think all music should be made for the love of making music and shared freely. 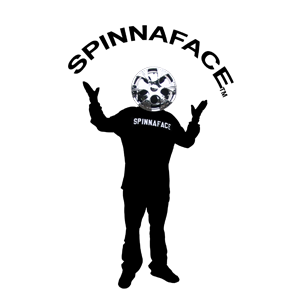 All Spinnaface’s music is 100% original, independent and free under creative commons. 5. You’ve got quite the array of musical toys, what are you using right now for your live sets and productions? Has this set-up grown slowly over time? Live-set: Mac laptop running Ableton Live and MaxMSP. Jazzmutant Lemur, Korg PadKontrol and an audio interface. Sometimes a Xone mixer. The live set-up has evolved a lot, and will continue to. At first we were running some custom MaxMSP apps to sync the lemur to live. But now we run a M4L patch developed by JM and custom midi-mapping. I wanted to do something different and unique when performing. The Lemur is great because its endless customizable so that really felt like the best fit. The only thing it lacks is tactile control, so the padKontrol or a mixer is good for that. In the future I plan on adding more tactile controls, more FX and more loops and sounds from the new album. In the studio: Honestly about 90% is done on a laptop, usually with headphones. I use Ableton Live, MaxMSP and a lots’o’plugins. We hook-up and funk around with a lot of different hardware, midi controllers, synths, fx etc. But very few we actually keep and use in final production. The only hardware staples are a 25 key midi keyboard, a drumpad and a monome128. Everything is so much easier in the computer and much more flexible, which leave more time to be creative. It would be great to have a few really nice pieces of analog gear for mastering, like a dope limiter, saturation or EQ. Mixing is all done in a studio, really just to be able to hear the sounds in a good room. Usually all the mixing and mastering is done digitally. 6. I’m learning about producing with Ableton, what tips do you have for young producers who are just getting familiar with creating their own grooves? Practice, as much as you can, and then some more. Knowledge is king. With the internet you have an endless resource of information. Youtube has 100s of awesome tutorials on Ableton production, tricks, sound shaping, mixing techniques, dj techniques, mastering, etc. There are dozens of great websites, forms, books and videos packed full of helpful informations, read read read, study study study. The internet is also packed full of free sounds, samples, plug-ins and applications, all can be helpful and inspiring in creating your own sound. Copying is good for learning. Try to copy tracks you like, part for part. Copy the drum patterns, the basslines, the melodies. This can be a great way to better understand song writing and music production. Just don’t release tracks you copy. Go see live shows, see what other people are doing. Ask to sit in on studio sessions, most engineers are super cool people. Try to get an internship at a studio, a lot of studios are always looking for internships. Shoot me an email, Im always down to talk to music production….